Practice makes publishable: The previous year, I’d made the Unhanged Arthur longlist, but advanced no further. Thankfully, the rules of the contest are such that you can reapply provided that the manuscript in question hasn’t already made the shortlist. So, I took in another round of beta-reader feedback – along with a healthy dose of what I’d learned from sending out the work to publishers and agents – and did a massive rewrite. The shortlisting was proof that it paid off. Take time to connect: Particularly up north, there aren’t as many opportunities as you’d like to connect with other writers and industry professionals. Add in a beautiful venue – the Arts and Letters Club – and some table wine, and you’ve got the makings of a great night. I particularly enjoyed speaking with Sian Bumsted of Whodunnit Mystery Bookstore in Winnipeg, who offered valuable insight into what independent bookstores hope to get from emerging authors. Independent bookstores thrive on curating hard-to-find content for their readers, so emerging authors shouldn’t be shy about getting in touch with indie bookstores. Shortlists matter: When you’re trying to break into the writing scene, you take every advantage you can get. If an emerging author is selling a book at an event or trying to convince a bookstore to stock their work, then being able to say the book has been shortlisted for an award is almost as good as being able to say that it’s won. To be blunt, potential readers – even those who enjoy a book’s premise – appreciate any reassurance that the book will also be readable and not riddled with errors. 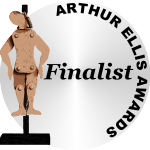 So huge thanks to the Crime Writers of Canada for putting this together – particularly the Unhanged Arthur for unpublished authors. I’m sure it was a ton of work, but very much appreciated. We need more contests like this. I had the pleasure of taking part in the CBC Canada Writes Lawmakers and Lawbreakers Challenge yesterday, in which writers were asked to prepare their best description of a sleuth or villain in 140 characters or fewer. Jackson rose on unsteady feet, port sloshing in his glass. “To absent friends and fallen officers,” he said, eyes bleary. Litz yawned. His breath tasted of stale coffee and sweetener, with a hint of the Highland malt he kept beneath his cold files. A lone drop of blood slid down the blade of the gleaming dagger. It clung to the tip for a small piece of eternity, then fell. A huge thank you to everyone who organized the event. I very much enjoyed myself, and appreciated the introduction to many of Canada’s writers.